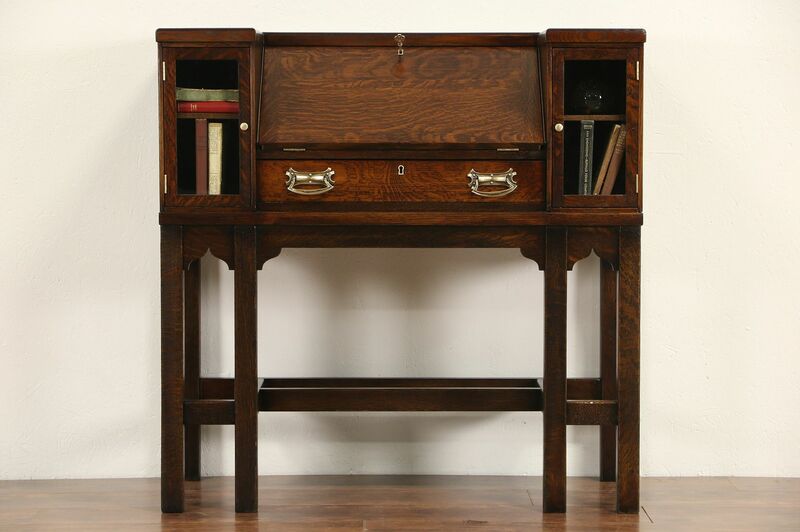 A secretary desk from the Arts and Crafts or Mission Oak period about 1905 has an excellent deep rich finish. Quarter sawn oak has beautiful grain, brass pulls and wavy glass doors are original. American made antique Craftsman furniture, the drop front is supported by brass arms. Inside are small cubicles for papers. Adjustable book shelves are removable in right and left compartments. Dimensions are 40 1/2" wide, 19" deep, 40 1/2" tall and the writing surface is 31" high.